I appreciate how you arrived at the idea of your vision of a bag. It’s an epiphany: you did not find a bag that fit your needs; so you went ahead and made a bag that did. This is exactly similar to (also) Chicago-based Basecamp (formerly 37signals) not finding a web-based project management tool that fit their needs, and, therefore, making their own. All done without asking permission. Just picking yourself. 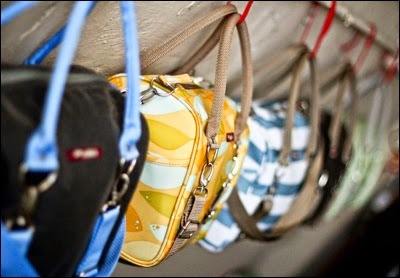 Was arriving at your idea for a bag, that satisfies both utility and visual appeal, a steady process? Or was it spontaneous? How did you capture your idea and visualize it? 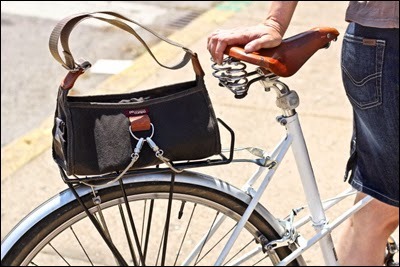 Before Po Campo, I would put my handbag in a canvas tote to protect it, and then strap that to the top of my bike’s rear rack with a bungee cord. I thought “there must be a better way to do this” and was shocked that no company was making a bag that could go from on-the-bike to on-the-shoulder. 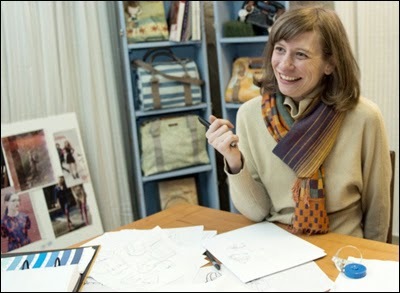 All of a sudden, my desire for a multifunctional bag went from something I wanted for myself to a business opportunity, and that’s when I started thinking about what I wanted the bag to do, and who I was designing it for. Did Po Campo officially launch in 2009? What were essential activities/steps taken to start and establish your company? And why were these activities/steps important? There was a lot that happened that first year, from inception in 2008 to launching a year later in July of 2009 (5 years ago!). 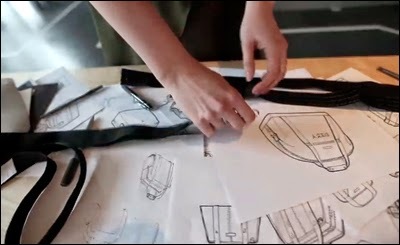 Probably the most critical was designing the bag and figuring out a way to manufacture it. For the design part, we had a rough idea of what we wanted and a general understanding of our limitations, the main limitation being that we couldn’t afford any custom-molded parts. We did some drawings and built a few basic prototypes ourselves, sewing part of it and stapling together the parts of the bag that were too thick for our sewing machines. We wanted to start with a local manufacturer, so that we could collaborate closely on the design of the bag, and also be able to work with smaller minimum orders. The manufacturer we found required us to source all the materials ourselves, so that was another feat, since our first bag had over 25 components, everything from the stuff you see, like fabric and hardware, to stuff you don’t see, like internal structural fabrics, spray adhesives, etc. It took us about six months to get our first prototypes made, which we took to the field for some user testing. 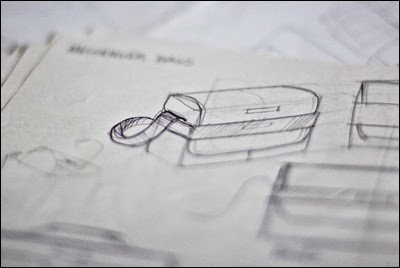 After we got some feedback on the design, we made some revisions and had our final prototypes ready 1–2 months later. 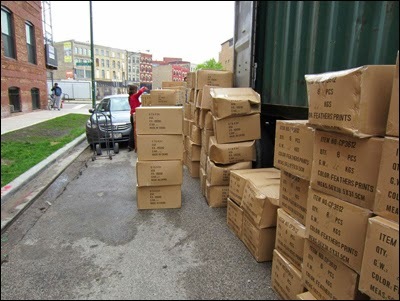 We took these final prototypes literally door to door to small retailers in Chicago to get some starting orders. We had about 12 retailers to start with, a mix of bike shops and boutiques. Most just bought 4–6 bags. The bags were finished in July (a few weeks late from what they were promised, incredibly frustrating at the time, but now I know that is par for the course! ), and we dropped them off at our retailers during a lunch break. We took other steps to set up the business, like becoming an LLC, setting up a bank account, etc., but while these are important, they aren’t as difficult. Can you believe that we launched without a website?! We had basically just a homepage with our contact information and a photo of a bag. I couldn’t imagine launching a product company without a website now, and it’s only 5 years later. Can you give a tour of how an idea, for a bag design, gets real? the Renegade Craft Fair 2014. I start every bag design thinking about a problem to solve. As owner and designer of the Po Campo bags, I try to carry one with me at all times. I needed a bag larger than what we were making that I could take on small weekend trips, or to the beach. From there, I thought about what I would take on those trips and made a list of possible features to include, most of which made it into the final design, like a separate shoe compartment and a way to carry a jacket on the outside of the bag. Prior to the Midway Weekender (above), all of our bags were very structured because they needed to hold their shape when attached to the bike. Since the Weekender did not have that constraint, I was looking forward to designing a “softer” shape. Many pages of sketches later, I had a couple ideas of what I wanted, and we made samples and refined from there. Who and/or what keep(s) you going in sustaining Po Campo? Po Campo is getting to a stage that if feels like it is taking a life of its own and chugging along, which is exhilarating. Of course, there are tough times when I worry that I’m not up for the challenge, but I feel like we have so much more to do, that we can’t stop now. Part of this is more bag and product designs that I have rattling around in my head, another part of it is wanting to participate in the “new urbanism” transforming our cities. There is an increasingly strong pattern of designers making and selling products and services. What is contributing to this reality? Two things, I think. The first is e-commerce, which makes it easy to launch products and get some sales right away without having to go through larger distribution channels from the get-go. The second is that it is becoming easier to make things with 3D printers and the like. A lot of the barriers to entry have been reduced. I count Patagonia as one of my business influences, as they’ve built a company and a culture with their values as their foundation. I realized that Po Campo isn’t just about the bags, it’s about building a company that gives us the life we want. After reading “Let My People Go Surfing” by Patagonia founder Yvon Chouinard, I decided on having unlimited vacation days and flex time at Po Campo. It was so liberating and wonderful, and made me love my business even more. There are four of us here in Chicago, two full-time and two part-time. We also have a network of sales reps around the country. I’ve always worked in smaller companies and like the size of about 12 people, so that is what I am shooting for with Po Campo. Technology does make it easier to work remotely, so I don’t think that we’ll always occupy the same space. How would you describe the work culture at Po Campo? I consider the culture to be collaborative, respectful, supportive and easygoing. I always wanted to work in a place with flex time, that encouraged travel and “giving back,” that honored introverted tendencies, that was built on mutual respect of the different strengths of all the people involved in the business workings (i.e. no egos). I’m most proud of building a company that is now like that, and only becoming better as the team is growing and our culture is taking its own shape. I want to build Po Campo into a lifestyle brand, so moving beyond just bags into other products and experiences. I have a vision in my mind, but am hesitant to reveal too much, because it is still taking shape. Ecommerce can be intimidating to approach and realize. How did you implement your eCommerce Website? What eCommerce platform did you use? Did you hire a Web developer to get this up and running? We started selling online through Supermarket, because our own website consisted of only a couple basic pages and did not have any e-commerce capabilities. Next, we added a widget to our site to be able to handle purchases. Finally, in 2012, we completely revamped our site and added a Shopify store. We had a designer and programmer customize our Shopify store to match our website theme perfectly, but I know Shopify has some great basic templates to get you up and running without much fuss. Many independent makers, including those specializing in making bags, exhibited at the Chicago Mini Market, Renegade Craft Fair 2014. This is only one showcase. How do you cope with the competition in bag design and production? Po Campo bags have such a unique blend of style and function that I don’t worry about competition too much. The more established markets, like Renegade, do an excellent job of making sure that there is a good assortment of makers present, so it doesn’t feel like a bunch of people doing the same thing. How do you get the word out about Po Campo? How do you attract customers? What approaches are effective? We do a mix of things. We advertise a little online and we’re pretty active on Twitter, Facebook, Instagram, Pinterest, and through our newsletters. We also do events in person to meet current and potential fans, and to tell them our story. The most important thing, in my experience, is to not take any breaks! You have to be “out there,” in some capacity, all the time. I think we’re bombarded by so many messages that it is easy to forget about a little brand, if you aren’t reminded of it on a regular basis. Usually we agree on the ultimate goal, just disagree on how best to achieve it. Once you realign around the goal and the aspects of the problem that you agree on, resolving disagreements is pretty easy. and making a business, how do you deal with stress? Daily meditation is incredibly helpful with diffusing the stress. I aim for 10 minutes a day—that’s all it takes. I really can’t recommend it enough, and you get much better with practice. I struggle with having to learn everything on the fly and then realizing you should’ve done it a different way after the fact. I just try to cut myself some slack and chalk it up to a learning experience. I have a couple different workspaces. My desk at our office is where I go to knock out emails or do spreadsheet type work. 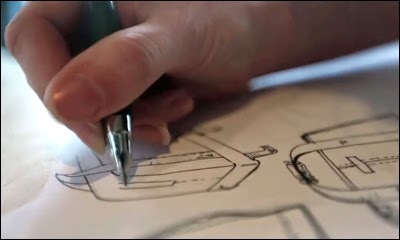 I like sketching out ideas either on my coffee table at home or at the shared desk at the office after hours. My home desk is the best for more thoughtful type of work, like working through strategy or writing. I encourage everyone to find the space that works best for what they need to do. We do a lot of visual brainstorming type work with Pinterest. It’s an easy way to share inspiration and comment and build together. We also leave working samples and drawings out while a product is in development, as you never know when inspiration will strike. I get my best ideas while riding my bike. Other than that, I enjoy the arts. Art galleries, plays, music—experiencing other people’s creative output really fuels my own. Also, taking long breaks from email. I suppose something that doesn’t do what it was intended to do. my style of bags and get it out there”, what’s your response? Do it! Just give yourself a loooooong runway because it takes a long time (and a lot of money) to get something up and going. I’m a native Chicagoan, and I think there is a roll-up-your-sleeves-and-get-workin’ kind of mentality here. Honest, hard work is really valued, and when people agree to help you, it’s not just empty sentiments, they really commit! The flip side of that is that people are suspicious of shortcuts and grandiose plans, which can be hard when you’re starting something new and you have ideas of how to do things differently. 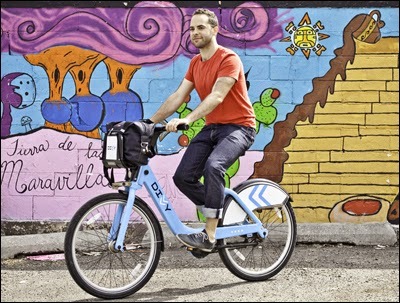 a bike-friendly city, notably with the installation of Divvy. What do you think about this urban development? You’re right, I’m very stoked! The addition of the network of protected bike lanes and Divvy has literally transformed the city. So many more people are biking, and people seem more open to the idea of biking for transportation in general. I think it is a vital part of reimagining our cities for the future, and I’m thrilled to have Po Campo be a part of it in our small way. All photographs courtesy of Maria Boustead.